We endured a week of Celebrity contestants to return to the affable Andrew Haringer, who has two wins in the bag. Will he nab a third? As you might know, I offer all five-time champs the opportunity to pick the theme color for the week following their loss. This would be 7xer Greg Seroka’s turn, but he’s not on Twitter, so I have no way to ask him that isn’t entirely sketchy (and not just sorta sketchy). Instead, this week’s hue is based on the logo of La Montaña Restaurant in Steamboat Springs, Colorado, where Greg is the executive chef. Tonight’s game was notable in that all three Daily Doubles were in the second row – and both Andrew and Fritz failed to take advantage of them in Double Jeopardy!. Speaking of which, guess who else under-wagered on an $800 Daily Double in a category on the atomic elements? Cindy’s low score makes things easy tonight – a nice way to ease back in to regular play. If Andrew doubles his score, he’ll have 26,800. To cover this all-in wager, Fritz will need to wager 10,200. An incorrect response with that wager will leave Fritz with 6,400. To stay above his total, Andrew can wager up to 7,000. A successful doubling will put Cindy at 1,600. Fritz could wager at most 15,000. 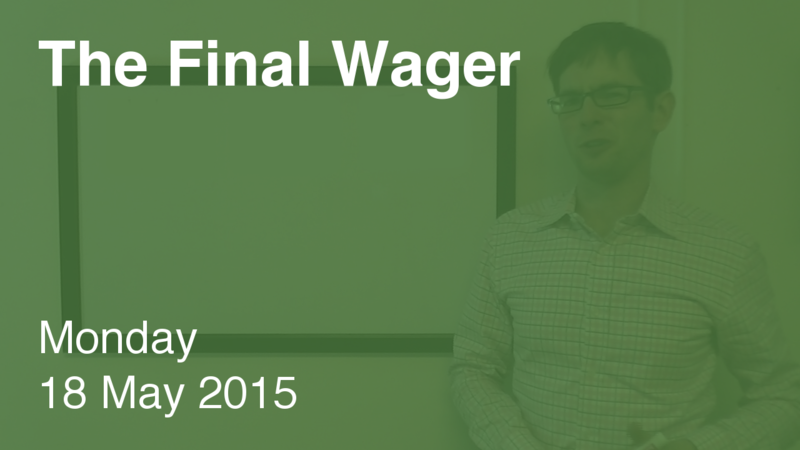 If Andrew makes the rational maximum wager of 7,000, Fritz will need to wager 3,800 to cover him. If he’s wrong with that wager, he’ll be left with 12,800. To stay above him, Andrew can wager up to 600. Note that he can’t cover a zero wager by Fritz with this range, which opens up a small can of worms. Fritz and Andrew are separated by 3,200, so we look to see where we can plug that amount – and its double, 6,400 – into our ranges. Andrew can take a big leap on the TOC leaderboard tomorrow with a fourth win – and, for all intents and purposes, Dava-Leigh Brush is now out of contention.